Book TWO in the Touch of Frost Trilogy is Absolute Zero. The Center is destroyed. Mandy and Georgia have their own place near campus and are ready to start their new lives as college students. All that’s missing is Mandy’s steamy relationship with Zach. His sudden distance and irritability has Mandy wondering…and possibly wandering. Nate Ashcroft, a beautiful, but mysterious, guy literally falls into Mandy’s life, shattering her already unstable relationship with Zach. 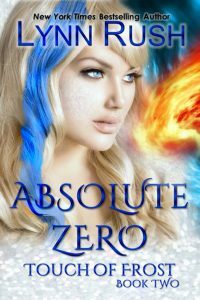 When an unknown agency sets its targets on Mandy and Georgia, ugly truths of Mandy’s powers, her parents’ deaths and the people she’s chosen to trust send her life into a tailspin. One only her death can stop.